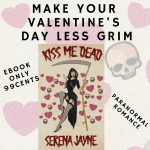 Home Posts tagged "new release"
Kiss Me Dead is Now Available at EBook Retailers! My drabble “Banshee” appears in Neon Druid: An Anthology of Urban Celtic Fantasy. A collection of seventeen short stories, Neon Druid puts you face-to-face with lecherous leprechauns, debaucherous druids, mythical sword-wielding warriors, and an entire pantheon of deities and monsters pulled from the illuminated pages of Celtic mythology.